One thing I discovered during my initial examination of my CD Unit, (and inherent clumsyness) was a loud constant clicking noise when the unit was powered on. This only came about after I had inspected the original transport, but I think something like this could potentially occur in a unit anyway and can be fixed without replacing the transport (in most cases). 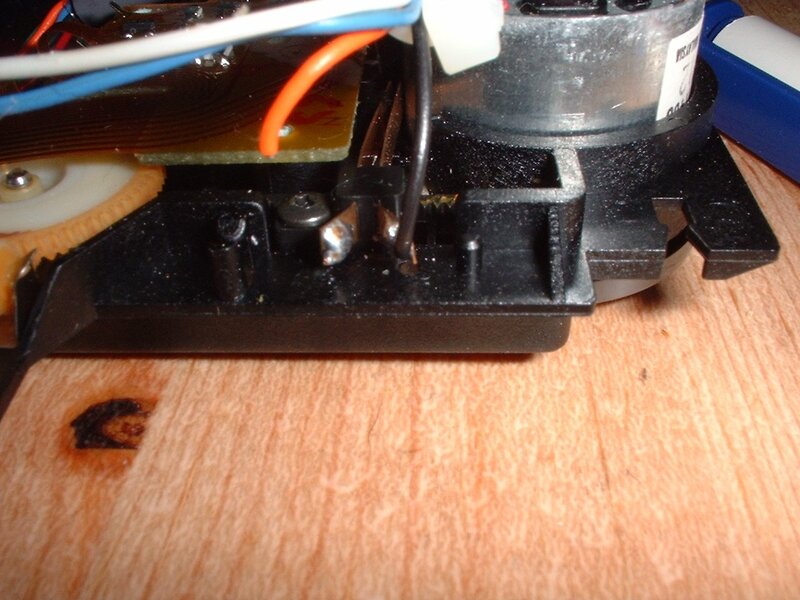 Here you can see the wire snapped off from the zero switch. To fix all you need to do is simply re-attach this wire to the point where it has been snapped off from (which is obvious as the other has already got a connection). As I replaced the whole transport I can only assume that it would be possible to repair this whilst the transport is still in the cradle, as the points are very accessible. Simply remove the transport as described in the Transport Replacement Guide and reconnect this wire with a small amount of solder, and rebuild the unit, which should now, be as good as new again. There you go, nice and simple, and a lot cheaper than a new transport.